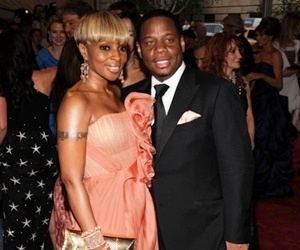 Mary J Blige Files For Divorce. challenge what I did: 'Why are you drinking? Why do you hate yourself? You don't need to be around people who tear you down. You're beautiful, Mary.' He was the first man to ever tell me that." She later slammed breakup rumors in 2012. "My marriage is not on the rocks, but I would be a liar and my fans would hate me if I said to them, 'Oh, we're perfect and everything is great,'" she said on The Wendy Williams Show in February. "We have situations just like everyone else. We're not out in public trying to kill each other, but it's real. We love each other." On whether she wanted kids with Isaacs, she added: "When it's time, when it happens, it's in my future. I'm not planning it."